To some people, commitment means giving up more than you are getting. To others, it means assuring you always have what you really want regardless of any other options. Your point of view on commitment has a lot do with the balance of modalities in your natal chart. 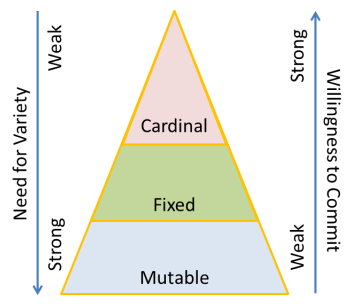 Are you mostly cardinal, fixed or mutable? Modalities tell the story of commitment. Your willingness to make commitments, attitude toward commitments, and ability to stick to commitments are determined by the balance of modalties in your chart. With the sun, moon and rising sign having the greatest influence, you can look at the signs of the planets in your chart to get a good idea of how you handle commitment. The modalities are best conceptualized as forming a pyramid. The cardinal signs form the top point of the pyramid. Like the head of an arrow, they are focused and always moving toward a goal, yet because they are at the top of the pyramid and narrowly focused, they take up the least amount of space on the modality pyramid. So, they experience the least amount of variety in their lives. They are the quickest to make commitments because they see commitment as the end-point of reaching their goals. However, they don't always stick to their commitments because they easily become inspired by new goals. The fixed signs are in the middle of the pyramid. They take up more space than the cardinal signs, so they experience more variety in life. They are slower to make commitments. But more than the cardinals, they are willing to stick with them because they are less inclined toward forward movement. The mutables form the bottom of the pyramid. As the furthest from the top point, they are the least focused and goal oriented. They take up the most space in the pyramid, so they have a strong need to experience the most variety in life. They are the least willing to make commitments or stick to commitments they do make. The cardinal signs are the quickest to commit. As the modality at the top point of the pyramid, they are the most narrowly focused. Goal oriented, they see commitment as a way of assuring they keep what they fought to win. They aren't interested in floating around from this to that and experiencing the most life has to offer. They would rather focus their energy on specific things, one at a time, so they can feel that constant forward-moving energy their cardinal nature needs so desperately. These signs know that when you spread yourself too thin among too many things, you never get ahead. However, the cardinal signs are not the signs with the most deeply felt commitments. If a new challenge inspires them, they can drop their current commitment and move on to the next one. The fixed signs are slower to commit than the cardinal signs, but once they commit, they are more likely to stick to it. These are the careful people. Although in matters of romance, Leo has a weakness for rushing into commitments, which is counter to their fixed nature. They do, however, stick to their romantic commitments better than most signs. Overall, the fixed signs take commitments seriously. They don't see them as the natural end-points of challenges like the cardinal signs. They see them as long-term decisions to give themselves completely to another person, career, idea, etc. In between the cardinal and mutable signs on the modality pyramid, the fixed signs neither want to focus their energy too narrowly, nor do they feel the need to spread themselves out to experience as much as possible. They prefer to carefully choose things that matter the most to them, and once they have deliberated thoroughly over whether the particular things are worthy of their time and effort, they commit. Then, because they invest so much in the decision process and take it so seriously, they really want to stick to it. In the end, they are the signs who enjoy commitment the most. Commitments make life feel real and solid. Commitments make them feel like their time and energy is not wasted on things that will come and go. The fixed signs like predictability, and commitment is the perfect way to achieve it. The mutable signs see commitments as endings rather than beginnings. For them, committing to something is the same as saying "no" to everything else. Above all, the mutable signs want freedom. Commitment is the opposite of freedom. At the bottom of the modality pyramid, the mutable signs want as much variety as possible in their lives. They don't like final decisions that close out all other possibilities. It's difficult for a mutable sign to commit to a plan for the evening, so expecting them to commit to something life-long, like a career or marriage, is asking a great deal. They prefer dating, and they prefer jobs that offer the most flexibility possible. However, there is a back door into their world of commitment issues. There are commitments that actually give them more freedom. When an opportunity to commit to something that expands their world comes along, they are quite likely to accept it. Committing to a career that guarantees freedom in their own schedule and ample money to experience all life has to offer appeals to them. They are willing to commit to marrying someone who takes care of their basic needs and gives them money, which frees them to experience more of life.